Oral tradition holds the Moreshwar Ganpati temple in Moregaon, Pune district, Maharshtra, marks the spot where Lord Vishnu prayed to Ganpati before fighting the demons Madhu and Kaitabh, and killing them. This is also the spot where Shree Lord Ganesha killed Kamlasur, the daitya who was oppressing devotees. As the lord was seated on the peacock, he came to be known as Mayureshwara or Moreshwar. Happy Birthday. Happy Maghi Vinayak Jayanti to all devotees. 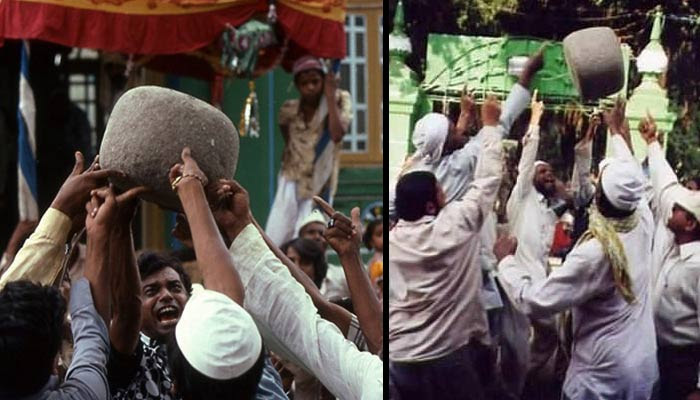 A heavy stone at the dargah of Hazarat Kamar Ali Darvesh in Pune can reportedly only be moved if 11 people chant Kamar Ali Darvesh at once and use one finger each to lift the stone! It is said that the stone, which does not budge if the number of people is not 11, flies 11 feet in the air if lifted according to the prescribed manner. Thus lifted the stone is said to be light as a rose petal.